The trillion-dollar watch has been underway for several months now, as stock observers have watched whether Apple or Amazon would become the first company in history to reach a market capitalization of $1 trillion. 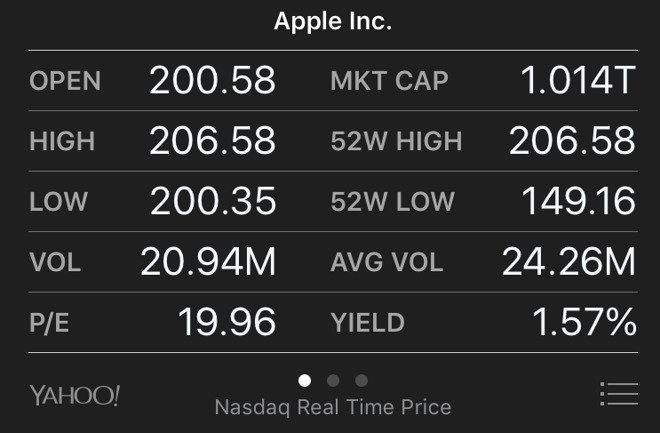 Apple's strong third-quarter earnings have been pushing the company's stock upward this week, and it hit another milestone, a $200 share price, on Wednesday. And while Apple remains very close to reaching the magic $1 trillion mark, it hadn't yet hit it as of Thursday morning. On Wednesday, Apple announced an adjusted share count, which is now 4,829,926,000. According to CNBC, the new count means that Apple's stock will be required to reach $207.05 in order to hit the $1 trillion market cap. Under the previous share count, that number was $203.45. The stock tickers were, and are, using the older share number. Some stock tickers Thursday, including the one on Apple's own Stocks app, listed the valuation at over $1 trillion, but that's based on the old data that was provided by Yahoo. Apple reached as high as $206.42 on Thursday morning so far, a nearly 5 percent gain over its opening price of $200.58, but still below the number needed to reach $1 trillion. But, that number is in sight.